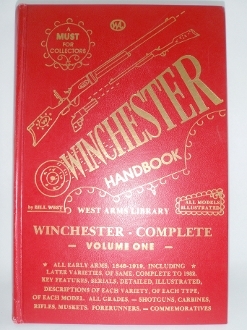 Book Details: This book serves as a historic reference and identification guide Winchesters. The book shows wear and handling marks, edge & corner wear on the cover. The binding is crumpled & torn at the bottom, see pictures. Black & white illustrations. Estimated 230 pages (pages not numbered), pages are numbered chapters. 6 1/4” x 9 1/4”.